If these were the kind of building blocks we were playing with as kids, we'd be a lot more imaginative and active! 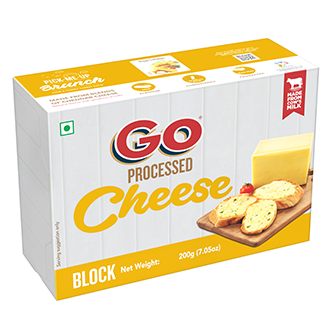 Made of pure cow's milk, GO Processed Cheese Block is known for its high melting property and smooth taste. Go nuts with your imagination! Anything and everything can be made cheesy with these blocks! If these were the kind of building blocks we were playing with as kids, we’d be a lot more imaginative and active! Made of pure cow’s milk, GO Processed Cheese Block is known for its high melting property and smooth taste. Go nuts with your imagination! Anything and everything can be made cheesy with these blocks! Potato rolls stuffed with chilli-garlic sauce are great as a snack for your kids and as a scrumptious starter while entertaining. Step 1 Combine the potatoes salt and pepper in a bowl and mix well. Step 2 Divide this mixture into 6 equal portions and shape each portion into a small round. Step 3 Press a little in the center of each round to make a depression. 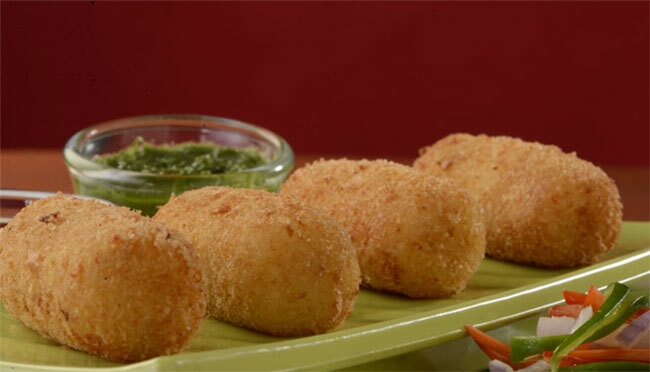 Place 1 tsp of the cheesy filling in the depression and again shape them into cylindrical croquettes. Step 4 Combine the plain flour with 3/4 cup water and mix well, till no lumps remain. Step 5 Dip each croquette in the plain flour-water mixture and roll in the bread crumbs till it is evenly coated from all the sides. Step 6 Heat the oil in a kadhai on a medium flame, and deep-fry the croquettes till they are golden brown in colour from all sides. Drain on an absorbent paper and serve hot.